Though the Aquarius man and Cancer woman do not have characteristics that are similar in nature, their relationship can flourish if they work towards it wisely. The Aquarius man and Cancer woman need to understand their differences in order to work around it and spend happy times together. The Aquarius man likes his freedom and independence and will not give it up for his partner or any other person in his life. This works negatively with the pair because even though the Cancer woman is not possessive, her actions are perceived to be controlling. The Cancer woman is mysterious to an extent because she prefers keeping her true self to herself. She does not let out her emotions and feelings as easily as the Aquarius man does. For this reason, she is often perceived to be arrogant and egoistic. However, if one were to look deeper, they would see that she is a warm, gentle and hospitable person. She is very gracious and kind- hearted which is what works in her advantage when she is in a relationship. The Aquarius man however, is his own person and wouldn’t care less about the strings that come attached in a relationship. However, when an Aquarius man is in a relationship, you can expect him to be loyal and honest only if he is given the freedom to enjoy his space. He will retaliate strongly, if he feels that his independence is threatened by an outsider and will not react favorably. If the Cancer woman understands this nature, she will be in a better position to handle the relationship. 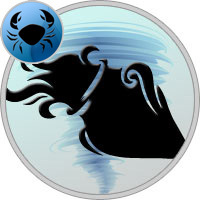 The Aquarius man is very practical and strong headed about the decisions he takes in his life, whereas the Cancer woman isn’t. She allows her heart to rule her mind and make the decisions and this is where most of their brew. In sharp contrast to the caner woman’s hospitable personality, the Aquarius man portrays characteristics such as aloofness in day to day life. Though these differences cause quite a lot of concern for the Aquarius man and the Cancer woman it does not pose a serious threat to their relationship. This is because both the Aquarius man and Cancer woman are intelligent and knowledgeable creatures who know how to work around their differences for mutual benefit, trust and happiness.